The Johnny Cash Show was a television music variety show hosted by Johnny Cash from June 7, 1969 to March 31, 1971 on ABC; it was taped at the Ryman Auditorium in Nashville, Tennessee. Now Six String Presents and The Johnny Folsom 4 bring the show to the newly renovated 1940’s Cary Theater for 2 nights on November 23rd and 24th, 2018. The last time Johnny Folsom 4 played the Cary Theater we sold out of tickets days before the show. This time they’re returning with a cadre of special guests and a bigger show! We’ve added a second night so don’t miss out. Get your tickets now! 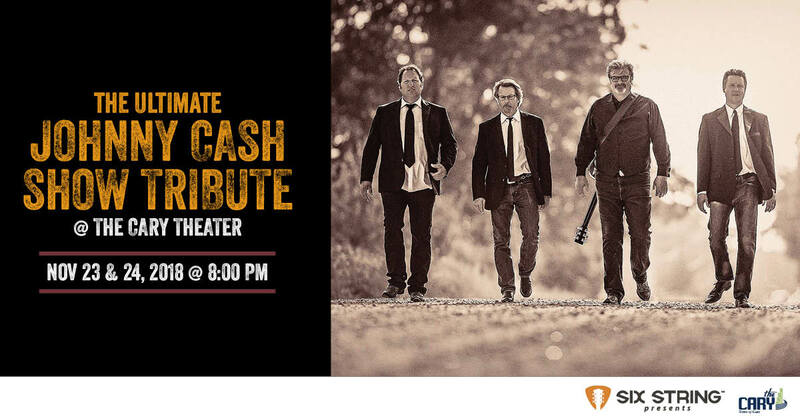 This show will feature the ultimate Johnny Cash Tribute Band, The Johnny Folsom 4 as the house band both nights. Each night will include a different song list with special musical guests singing some of the songs featured on the original Johnny Cash Show. Get your reserved tickets early to what promises to be a fantastic night of music, stories and song.